Beat the pudding mix and milk with a mixer for three minutes. Fold in pumpkin until thoroughly integrated. Chill for 20-30 min. Meanwhile, mix the Splenda and spices in a small bowl. Layer 1/3 c. pudding mix, followed by 1/4 cup cream and then another 1/3 c. pudding in a parfait dish. Top with a dollop of whipped cream and sprinkle the spice mix on top. Serve and enjoy! Makes 8 parfaits, each containing 9 g. carbs and 6 g. fat. 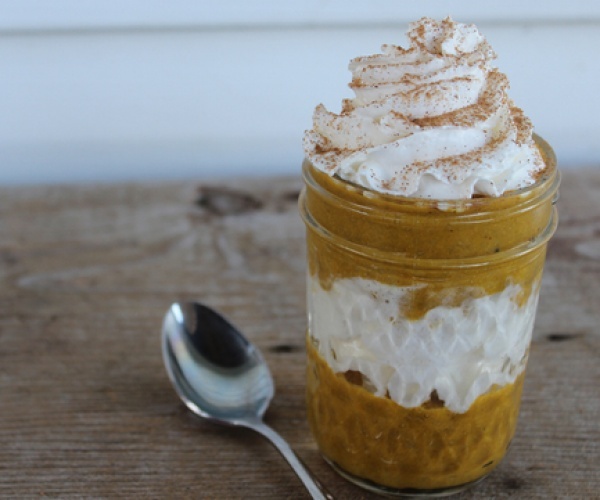 My son and family loved the parfaits, but we all agreed that a bit of pumpkin pie spice mixed into the pudding would improve the already yummy dessert even more. My husband, a pie fanatic, missed the crust and ended up dipping Girl Scout Trefoil cookies into his parfait. Next time I make it, I will layer crushed cookies on the bottom of his parfait. love this! I’m definitely going to do this! awesome idea! These look amazing! I wonder if you can use the same concept on other pies like, say, apple? I’m always looking for an excuse to eat pie and not feel guilty.